Writing letters is perhaps one of the most traditional forms of human communication, but an art that is sometimes disregarded in our modern world. With technology prowess at the forefront of contemporary life, penning a letter is something that we can often overlook, opting instead for the ease of a quick text or email. Leading high street retailer Ryman Stationery is the traditional authority for writing tools and equipment. Despite the phenomenal pace of technological advances, it seems clear that we still value using pen and paper to say a hello, a thank you or tell news. Throughout all walks of life, traditional means can often outperform hi-tech gadgets and it is a method that we feel safe using. No software malfunctions, no need for information back-ups and ultimately, creative freedom. And it seems that the rise in popularity towards penning traditional letters is rife amongst youngsters too. A report compiled by the National Literacy Trust finds that letter writing has risen in popularity, with 36.7% of children and young people now writing letters in their free time, compared to 28.9% in 2011*. 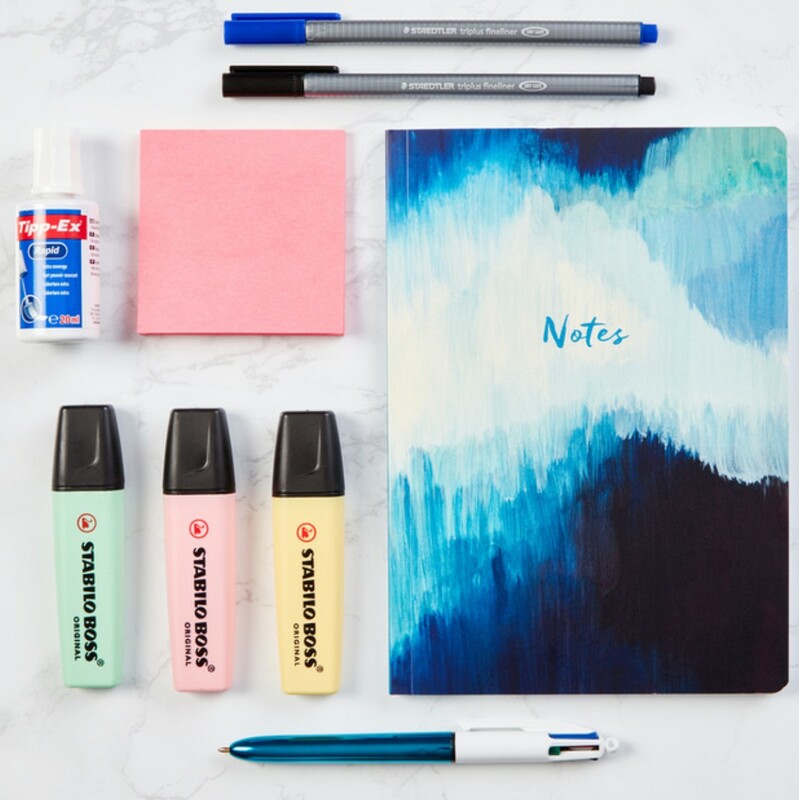 To help inspire your scribing, we’ve rounded up our favourite writing equipment and ideas from Ryman Stationery. So, whether you need to write a thank you letter, catch up with a pen-pal or even a create a romantic love letter meant to impress, we’ve got the perfect stationery to help you pen the perfect note. Say it best with pen and ink. All letters start life as a blank canvas, so make sure yours is the perfect backdrop before you start scribbling. A good workman never blames his tools and how could you, if you have the right ones to hand? The Inspire Me Writing Paper and Envelopes 20 Sheets 10 Envelopes (£5.99) set provides a stunning base upon which to forge your innermost feelings and create a beautiful letter to stand the test of time. Got a pen-pal overseas? Tell them all of your news and updates, no matter the distance with this classic Basildon Bond Airmail Writing Pad A5 70gsm 80 Pages 40 Sheets Blue (£4.49). With a guide sheet, blotting paper and matching envelopes included, you’ll be sure to pen the perfect prose to the highest standard. For everyday writing, you won’t go wrong with a Ryman Writing Pad Ruled 175x135mm 70gsm 200 Pages 100 Sheets (£2.99). Perfect for informal letters or general correspondence, it will become an essential addition to your writing desk. For letter writing with an authentic vintage feel, traditional tools such as fountain pens or calligraphy sets are perfect for formal letters or invitations that you need to look the part. A classic allrounder comes in the form of the Parker Vector Fountain Pen (£13.99). In a colourway choice of blue or black and the ability to take either Parker or Ryman ink cartridges, it’s a fantastic addition to a pencil case or stationery cupboard and guaranteed to become a staple for quick and efficient letter writing. For the fashion lovers who want to inject some colour into their traditional prose, the Stabilo beCrazy Colour Fountain Pen (£7.99) is your new best friend. Perfect for left or right hand users, it comes in three crazy colours, so you can choose the shade to suit you best. Alternatively, treat yourself to all three and let the fun commence! For true elegance, it doesn’t get much better than the Cross Bailey Medalist Fountain Pen (£39.99). With superior writing quality and the ability to be personalised, it will soon become your partner in crime, for years to come. Write on. For a timeless letter, boost your brilliance and set your strokes with the Manuscript Deluxe Calligraphy Set (£14.99). Featuring a calligraphy pen, 6 different sized nibs, ink cartridges in assorted colours, and an ink converter allowing you to use bottled ink, you’ll have all the equipment required to create a stunning letter, place card or invitation. A sure way to impress any recipient and create a lasting ‘wow’ factor to cherish forever. For little ones starting to write letters for the first time and experiment with their expressions on paper, make sure they have the right equipment to get them off to a head start. Indulge your darlings to a Stabilo Easyoriginal Start Right Handed Pen or Stabilo Easyoriginal Start Left Handed Pen (both £6.99). Ergonomically designed by scientists to improve both their handwriting and their confidence, so that they can enjoy letter writing without any of the worry. Help your youngster out with a Tikktokk Childrens Portable Writing Slope (£21.99). Ideal for aiding children to write at a correct angle and because of its portability, it’s perfect for use just about anywhere. Designed with little hands in mind, the Crayola Supertips Super Washable Pens Pack of 12 (£4.99) are a fantastic way for little ones to illustrate their letters and make them more personal. With an assortment of 8 bright colours, the washable ink means there’s no worry about marking clothes, hands or walls! For tiny tots, the Learn to Write Oxford Notebook A4 32Pg 80G (£1.99) is a fantastic way to help your child practice their writing and support their development. The notebook will assist them with upper and lowercase formation and features the unique learn to write ruling system, so they’ll soon be well on their way to becoming an author with authority. For letters with a colourful edge and an imaginative flare, inject some rainbow hues into your writing. These Bic Cristal Ballpoint Pens Assorted Pack of 20 (£7.99) are an easy way to spice up a traditional letter or even add some colourful illustrations to your lengthy prose. If you want to go all out, look no further than the Llama Gel Pens Pack of 48 (£5.99). Containing a delightful mix of scented, metallic and glitter pens, in a variety of colours, you’ll be sure that your letter stands out from the crowd and is a unique as you are. Show off your creativity in style. For the practical minded amongst you, the classic Bic 4 Colour Ball Point Pen (£2.99) is your go-to pen best friend. Featuring blue, black, red and green ink options combined in one handy barrel, so you’ll have it all, at the push of a button. This press release was distributed by ResponseSource Press Release Wire on behalf of Ryman Stationery in the following categories: Children & Teenagers, Men's Interest, Entertainment & Arts, Health, Leisure & Hobbies, Home & Garden, Women's Interest & Beauty, Education & Human Resources, Media & Marketing, Retail & Fashion, for more information visit https://pressreleasewire.responsesource.com/about.